Hello lovelies, so today I thought I would share with you this money saving deal! 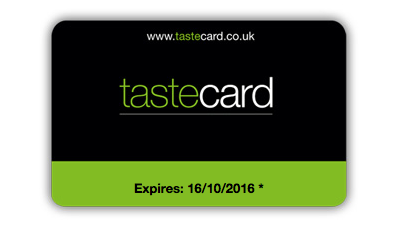 Especially if you're a lover of going out for meals, I was kindly given a taste card subscription for a year with some pennies to enjoy 24 hours with! Me and my Fiancé Dan looked on their website to where was more local to us and we found one of our favourite Curry houses, Shimla Palace we knew they wouldn't let us down so we decided to use our evening meal there, you should book in advance with a taste card to avoid disappointment on arrival, when I actually rang to book a table they said we do prefer to know 24 hours in advance, luckily they let me off but at least I know now for future references. We had a gorgeous meal and the starters, main and desserts was a 2 for 1 offer so we saved around £9 on a whole as obviously it doesn't take money of the drinks, they always add up the bill right! But a savings a saving at the end of the day and we were happy with that, if we went and Dan didn't drink we would probably save a lot more aha. We had a gorgeous meal though and was so pleased we could use the card to save us some money. For a day time meal we decided to try out Ask Italian in Lichfield, it's about a 20 minute drive from where we live so not to far but in our area there isn't a lot to choose from on the taste card sadly unless you are a massive indian fan! I do love me an Indian but I wanted something different, I'd never been here before and we both absolutely loved it. Again the offer was 2 for 1 on the starters, mains and desserts and I made sure I booked 24 hours in advance just incase as they didn't know us like the previous place did. The downfall to the taste card - No weekend bookings??? Very limited if you can find some where, I also find it is a lot more Indian and Chinese based restaurants unless thats just because of my area, I obviously haven't searched everywhere but this will be great to have in my purse if we are having a weekend away as it will save us a lot of money in the long run. I definitely think its worth looking in to you can get a 90 day membership for a measly quid! 1 British pound, why the promotion code is available see how you get on with it, I believe you can get money of cinemas, hotels and even days out! I will definitely be looking into those, me and Dan really enjoyed our 24 hours with taste card as he had a day of mid week but sadly he works away all week and we only get to see him on weekends so this card wouldn't really be of use to us as a couple to wine and dine each other unless we went further a field but for breaks away I will keep it in my purse for a rainy day or a mid week treat to my family and friends. It's really easy to use once you have signed up, there is a search bar once you put in your post code all the restaurants come up then you must book your place, simple. 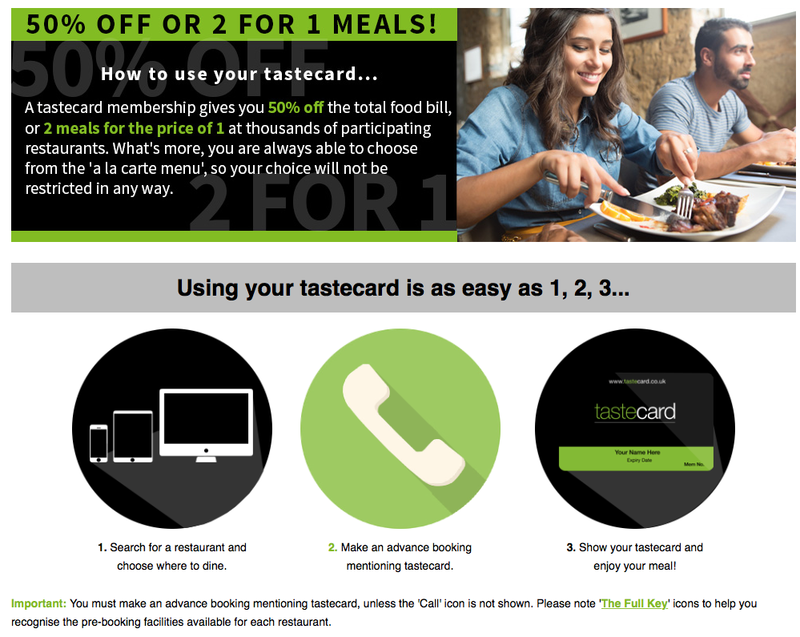 If this isn't for you do you have family or friends who are a lover of dining out? Wouldn't this be the most perfect birthday or christmas gift? You can get them a taste card gift!